Sorry. I really need to update my site. Yes, dear friends, it has been a while since I have done any work here. There’s loads of art that I have yet to upload and I hope to get a jump on that soon. Much has happened in my life and I am anxious to share with you all the wonderful things I’ve accomplished and created. Thank you for understanding and please stay tuned. You may, in the meantime, peruse my Instagram account to see the many works I will be sharing here in the near future. Many thanks for the continued support, love and blessings. Hello, all. I wanted to write a little something to let you know I will be getting around to uploading more art, newer and older, very soon. It has been a while since my last post and for that, I apologize but, want to assure you that even though I have taken a bit of a break from painting to focus on work, (art directing) I will continue to keep the art coming. Thank you for you support and love, always. PS. please feel free to follow me on Instagram at Drew Wootten Art to stay on top of my daily activities, artwork posts and, other bits of randomness I find. “Compendium” series pieces, new works coming soon. Hello, all. I hope you all are well. I’m back with a quick update. Yesterday I decided to open up a Big Cartel shop. If you’re not familiar with Big Cartel I suggest you check it out. Mainly my shop, where you’ll find I have selected a few works on paper for sale, all from 2013. 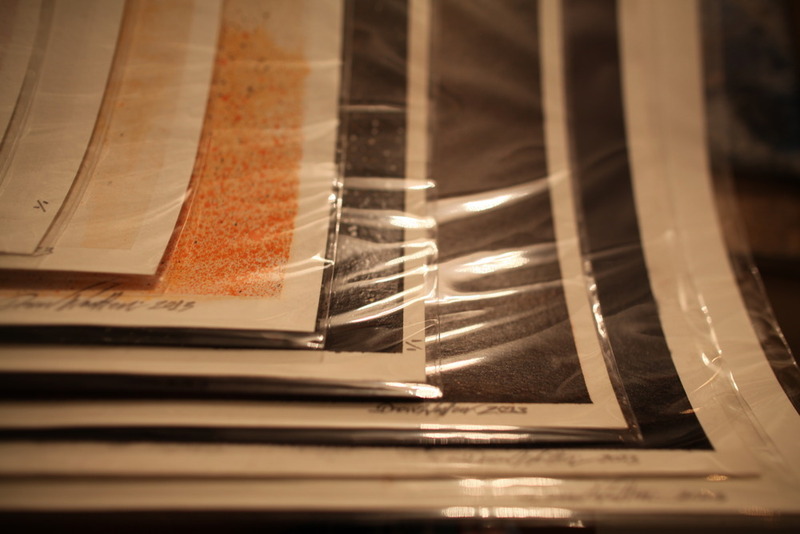 These works are on 18″x24″, 140LB, 300G watercolor paper and are one of a kind pieces, all signed and numbered. All works in my shop are currently on sale in conjunction with the opening of my shop on Big Cartel and, with my new Art for Sale page here on my site. Stop by today and purchase your own original Drew Wootten artwork. New exhibition in the works. Hello friends! 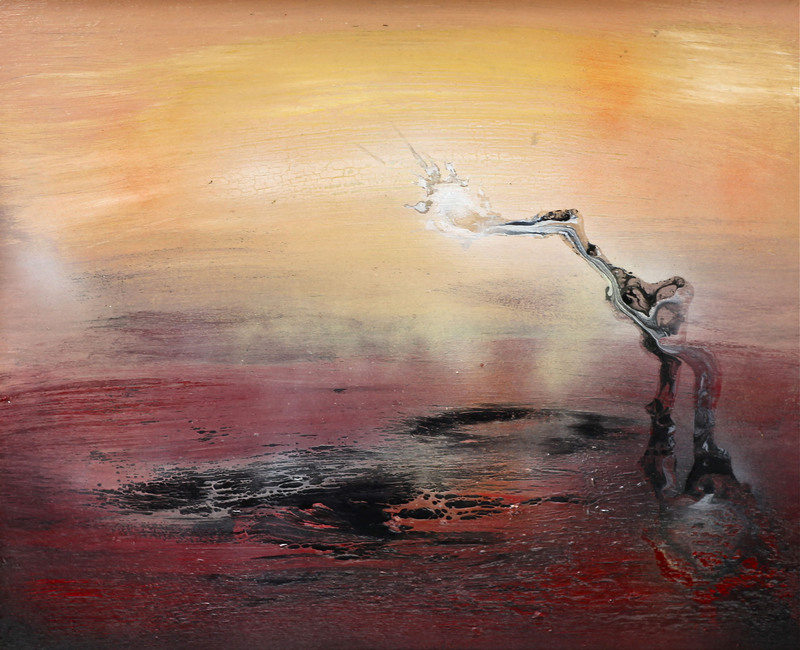 I am pleased to announce the first art news of the new year, 2014: I have been approached to exhibit my art. Though no dates have been set this will be taking place on Abbott Kinney in Venice, CA. Today I have a meeting with the art coordinator of the space and will be able to establish which works of mine will be the best fit and/or if new works will be a part of this exhibition. As a rule to myself I always like to create new work for new exhibitions. We shall see what time and size parameters permits. Please stay tuned and, as always thank you for your support and love. All my best. Hey there friends! My apologies for being away for a bit. I’ve definitely been busy with new adventures in the film and television industry. I’ve had the opportunity to work some great gigs and meet many new friends, artists and musicians while still being able to utilize my creative side by art directing for these projects. In addition to all this I have been working on my music in preparation for the completion of a few EPs to be followed by a full length album. More on that soon so please stay tuned. In the mean time please take a moment to check out some of my music project, The Yours Revue, and let me know what you think. You may also stay in tune and up to date with most of my current art projects, whether it be my art and painting process, my music and the unique album cover designs I create for the release of new songs or, my on set photos of how I make it all work on my instagram page. Hope you all are well and I want to thank you for your continued support, blessing and, love. Cheers! Hello friends! I’m back to let you know of a new exhibition I’m proud to be a part of. First, a little back story…. 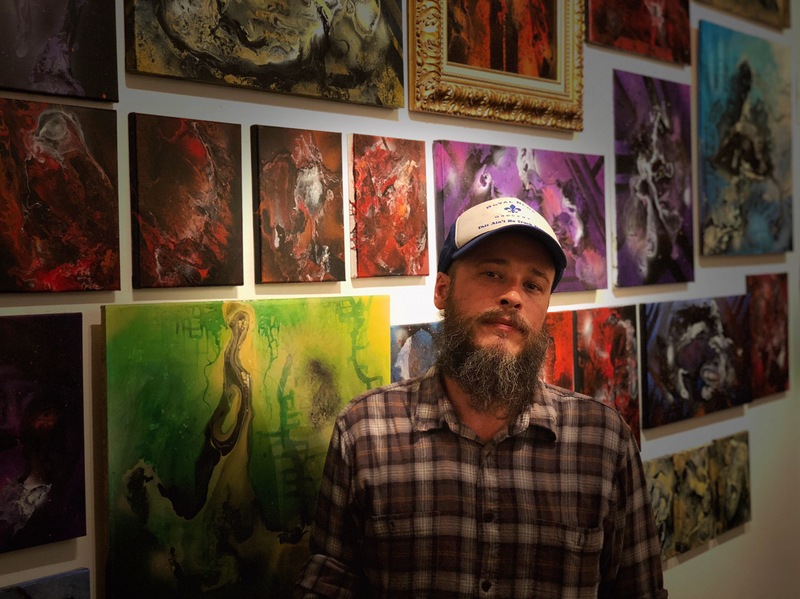 Over the past couple of years while showing in the Sea No Evil Art Show I’ve had the opportunity to show along side and meet some incredibly talented and well known artists. I am very thankful for that. Recently I was asked if I wanted to be a part of an upcoming group show to be curated by an artist colleague I have exhibited with at SNE, Christopher Umana. 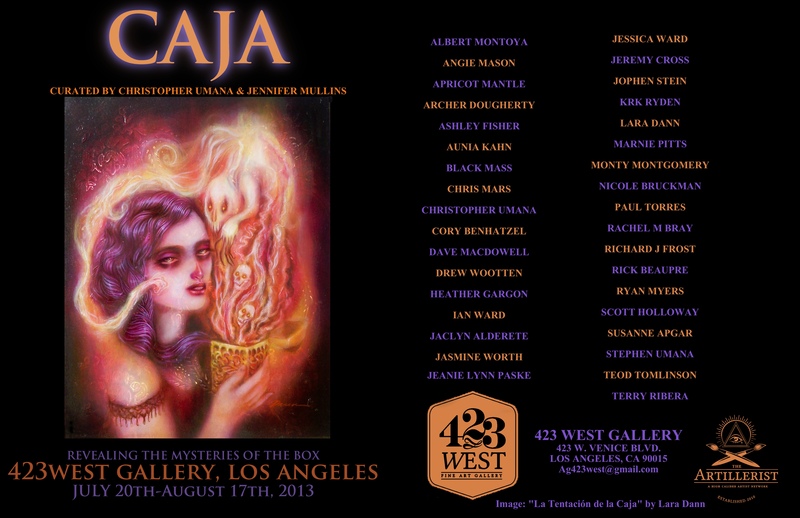 Of course I said yes and was honored to have been sought out for this new show, CAJA to take place 7-27-2013 at 423West Gallery in Los Angeles. Though I have yet to meet Christopher in person his work stands out to me as being very original and inspiring. This show has also given me the chance to be able to occupy wall space with one of my long time friends, fellow artist and, someone who has continued to amaze and inspire me, Jophen Stein. The piece I have created for this show has proven to be quite a challenge for me which I have no problem admitting. This is due to the fact that my artwork is primarily 2D in it’s presentation-I paint on wood, a flat surface. This has driven me to take my art and place it in a 3D type of situation. 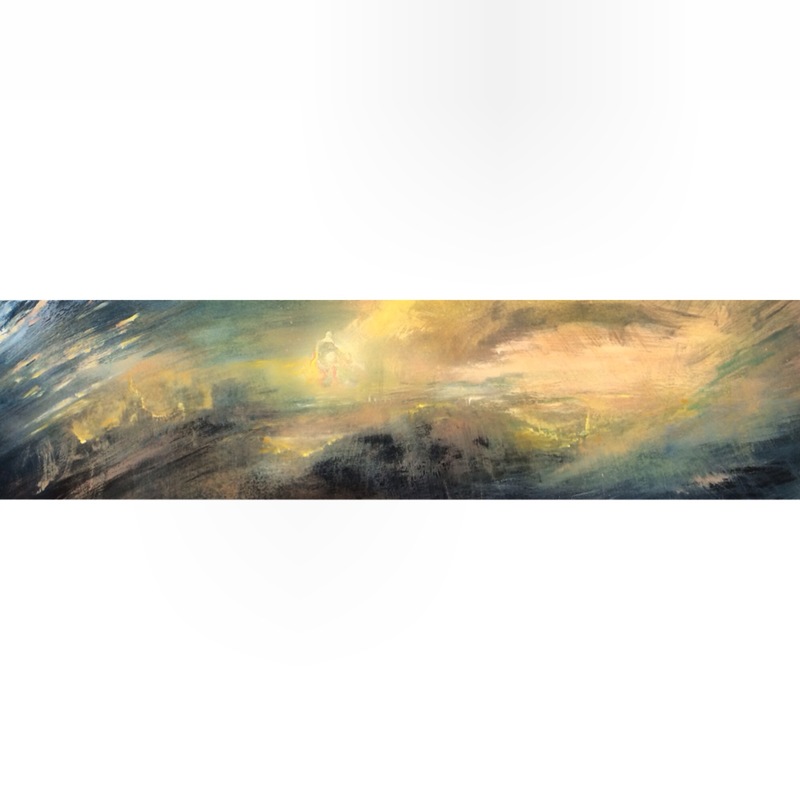 So, “Caja” means box in Spanish and for the concept of this piece I wanted to give the impression of seemingly peering out from some sort of box: to put the viewer inside the box looking out. This could be a window, a door or turning and looking back through some grand entrance. I chose a combination of these but mainly focused on the latter. Hopefully you, my friends, family and, artists colleagues can make the opening and share with me your experience of gazing upon my work and out into the universe. As always, all my best and I hope to see you there! Hello friends. I know it has been quite a while since I’ve updated my site here so please accept my apologies for that. On a lighter note, I have been quite busy with many projects including a couple of new exhibitions coming up and the production of my music. Here is the newest song from a collection of tunes that I have been occupying my time with. Please enjoy while I get ready to continue updating recent art work and possibly some more music by The Yours Revue. Be well and stay tuned for more info! While paining today I had a thought, or rather a recollection that was brought on by the way I had approached this particular piece. That thought was along the lines of how I wouldn’t mind kinda maybe teaching art. Painting to be specific. This is not a new thought. It is one of the main reasons I went to college and studied the art of painting: to teach it. Long story short, I have yet to finish up the proper schooling in order to attain such said credentials if you will. At any rate it was the approach I was taking, one of the first lessons I received, that made me think of this. I’d still like to do that. Here is what I did. It is still a work in progress. Enjoy. Greetings all! I hope you are well. I am please to announce my participation in a new painting exhibition at this year’s Lucidity Festival: The Totems’ Return. This 2nd annual event taking place next month will feature the works of many talented artists, a host of great bands, musicians and DJ acts. There will be live painting and interactive workshops open for your enjoyment. I may or may not be doing some live painting. We shall see. Hope to see you there, friends.